After over a year of recuperating at the Bermuda, Aquarium, Museum & Zoo [BAMZ] after sustaining a severe injury that saw him lose one of his flippers, a turtle is ready to be returned to the wild. “This little guy was brought to BAMZ on Christmas Eve 2012 in very bad shape, having sustained a severe injury and losing one of his flippers,” said the BAMZ newsletter. 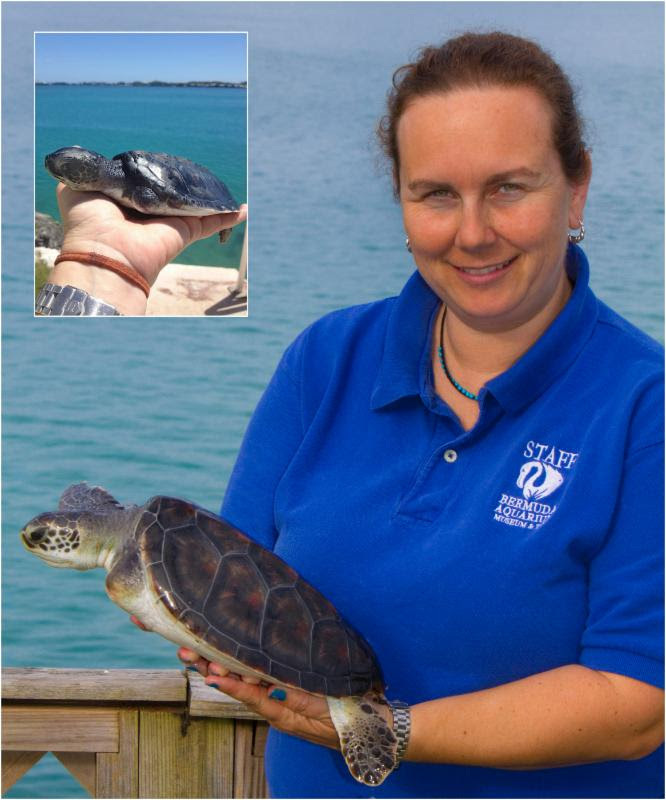 The photographs below show the growth that the turtle has experienced. In the inset picture, the turtle is seen in the hands of Animal Care and Quarantine Officer Roma Hayward in 2012, while the second picture, taken just last month, shows its increase in body size. yet another Ex Pat getting the boot! That poor little turtle is gonna be shark bait.